Rebel Galaxy is a space combat action RPG that reminds me too much of Firefly – die-hard fans know how hard it is to be remembered of the best space western to have ever seen the light of day. Only Cowboy Bepop and Serenity live to its standard – and one of them is a Firefly movie. My first impressions of Rebel Galaxy weren’t that good. My ship was moving way too slow, boosters depleted too easily and I couldn’t kill anyone with my lousy cannons. But, I was a Space Cowboy eager to prove himself so I stuck to my guns and continued playing Rebel Galaxy. I am glad I did so, because it’s one fantastic space game, with beautiful graphics, phenomenal explosions and amazingly designed ships. If you get passed the endless grind for resources, that is. You start as the captain of a huge clunky ship. If you get passed the inability to bring doom and terror to space, and get into trading, mining and bounty hunting, you have a chance to actually become a respected space sailor. Or, probably you fancy becoming an outlaw that kills miners and traders for their resources and battle space governments a la Rick and Morty – minus the whole fighting for a good cause thing. After you’ve earned your first honest pay check, it’s time to upgrade shields, engines, boosters and cannons – so fights don’t seem like an endless who throws a potato the hardest contest. You want to throw the potato the hardest, of course. You’ll eventually end up buying a better ship if you take more lucrative jobs – and this is were the repetition factor comes in. There are story missions that spice things up and add a rewarding plot-line, but the difficulty curve is bonkers. 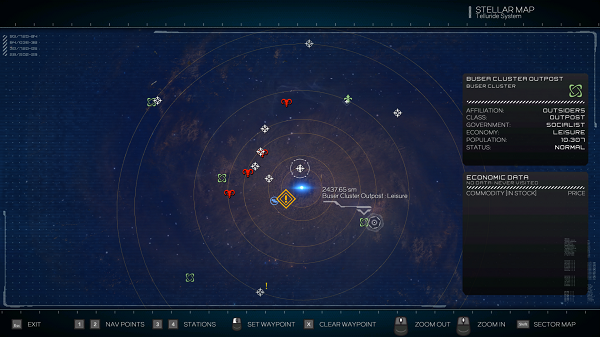 Missions increase in difficulty with no warning signs whatsoever. This means that you have to get back to side-missions and the endless search for loot and money to either upgrade your ship or buy a new one. Don’t get me wrong. These activities aren’t bad, and they are quite fun and interesting, but I would have loved more variety, as beyond the usual trading, bounty hunting and mining, there’s nothing else to do. Regardless of your chosen profession, you’ll spend almost all of your time battling other Space Cowboys – even when you aren’t looking for someone to dance with, a ship will find you. This gets us to navigation. Rebel Galaxy constrains flying through space in a 2D plane, so it makes battles naval-like – think of what you can find in Assassin’s Creed IV: Black Flag, but more fun. You can only turn right and left, as if you are sailing on a space ocean. You can’t go down, or up, no loop-the-loops and no barrel rolls. It keeps everything simple, and I’m pleased with the choice, but it feels like you are steering a ship, not flying in space. 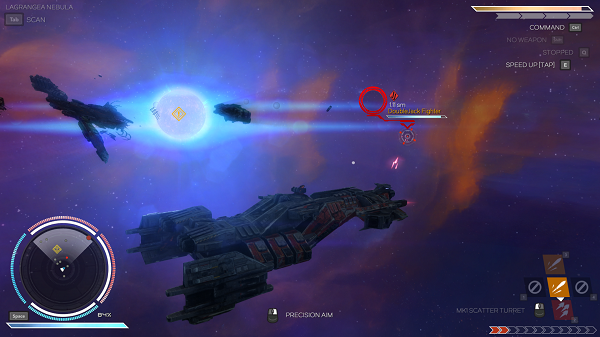 Space battles are the most fun thing about Rebel Galaxy. More so, when you happen upon a massive fight between factions. Position your ship – I love to call mine The Nameless Hope; alongside the enemy and unleash the powerful force of your broadside weapons. 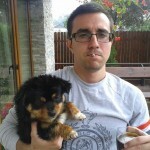 Hopefully, you’ve chosen to upgrade them as soon as you acquired the money. 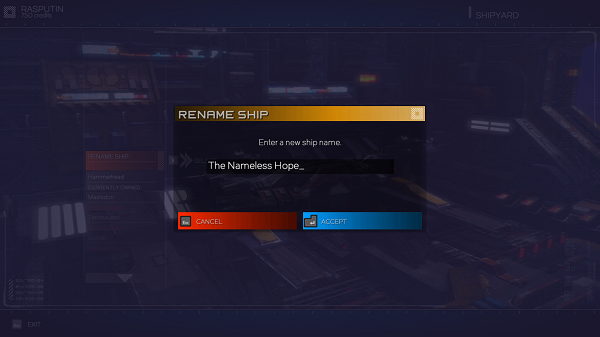 My second option was FireflyLover, but I realized I was becoming obsessed with Firefly…Firefly..Firefly..a..Firefly. They aren’t the most visually pleasing attacks – they are actually quite dull, with a few laser-like balls hopping towards the enemy; but by God, aren’t they a huge source of damage. You’ll soon make your presence aware and attract enemy guns. With a quick thumb to the spacebar you can employ a deflector – read, shield. It’s actually quite great. It’s activated by the spacebar, and it makes perfect sense for a reflex-based def mechanism. However, you can’t use your weapons while your shields are up. And this is where I run like the coward I am. 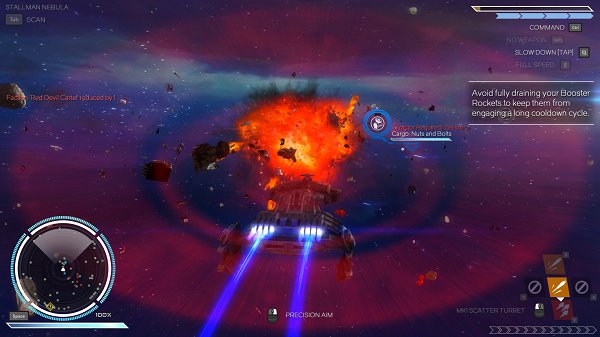 Rebel Galaxy doesn’t require you to pay attention to your turrets, because they auto-fire. However, I do love the fact that I have the option to manually aim them by switching weapons. They are best used when fighting small and agile ships. Using turrets zooms your view in to be more effective. Be warned, fighters can fly beyond your 2D plane meaning that turrets are actually the best, if not the only, weapon against them. Yet, the most used ability, at least for me, was a special shield that let me ram into enemies. Hey, I was already ramming into them, and rocks, without even wanting to do so, so it made perfect sense to buy it. When I had enough money to add auto-firing homing missiles and lasers I was the happiest cowboy in all the Milky Way. I could focus on ramming and dominating capital ships while my weapons were removing pesky fighters from the battle. Calling big skirmishes chaotic and exciting is an understatement. You destroy a spaceship and half the screen goes red because your turrets just destroyed one as well. Debris swims in space, and enemies cower in retreat. When big skirmishes become a habitual activity, they turn from fun to annoying faster that you can say – Don’t cancel Firefly please. You’re just exploring the mysterious plateaus of space when those pirates that were threatening you earlier decide to pull out of warp and fiercely attack your ship. You’re not in the mood, you just got out of a big fight, your ship needs to be repaired and you just want to finish the main mission. Does anyone know a Walmart nearby? It’s fantastic. Regardless of its flaws. It’s the only space game that I have actually enjoyed playing – that is, until No Man’s Sky launches, then it’s buh-bye everything else. I would have loved more side mission variety, and as someone who considers himself a skilled gamer, I would have loved more skill involved in it. Losing a battle doesn’t mean that you have done something tactically wrong, it just means that the other guy was better equipped for the space dance than you were. In Rebel Galaxy, you need to find better and quicker ways to earn more money, buy stuff with what money you’ve got in order to win. Rinse, and repeat. This lack of strategy was a bit of a let down and made the game a tad bit one dimensional. 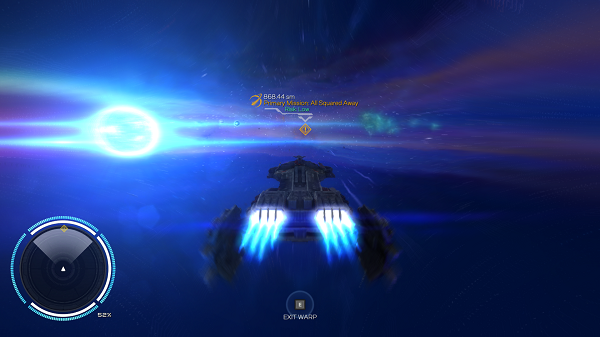 I wholeheartedly recommend Rebel Galaxy for everyone that is looking for a light space combat RPG. You can add your very own soundtrack at the beginning of the game. I had Vangelis’ Blade Runner Blues on repeat. 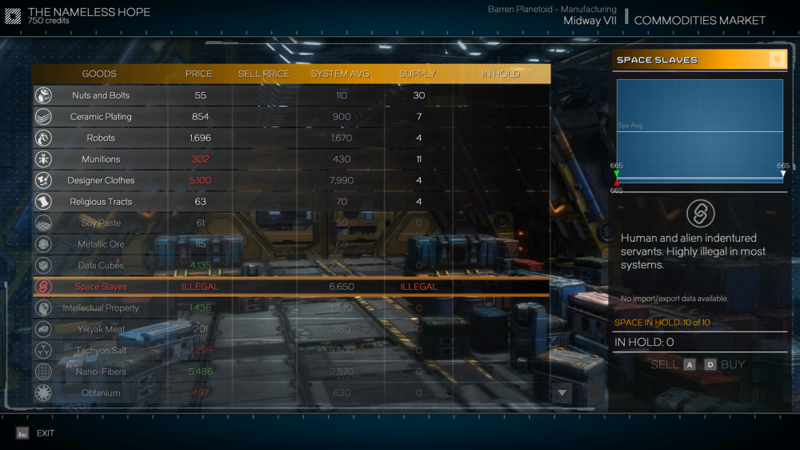 By the way, I had only one problem with Rebel Galaxy – hardware-wise. It couldn’t work with my Xbox One controller at all, so I had to stick with my keyboard and mouse. The developer recommends playing the game with a controller. 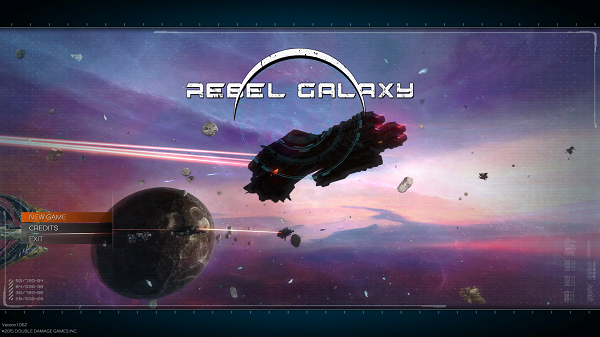 You can download Rebel Galaxy from Steam or GOG. At the moment of writing, it costs $20. At this moment, it is PC only. However, the game should be arriving on PS4 and Xbox One soon. Check our Game Deals and Promo page for awesome deals on games.